Charles A.S. Hall, Jessica G. Lambert, Stephen B. Balogh. 2014. EROI of different fuels and the implications for society. Energy Policy 64: 141-152. For nations examined, the EROI for oil and gas has declined during recent decades. Lower EROI for oil may be masked by natural gas extracted/used in oil production. The EROI trend for US coal is ambiguous; the EROI for Chinese coal is declining. Renewable energies lack desirable fossil fuel traits, including often higher EROI, but create fewer pollutants. Declines in EROI of main fuels have a large impact on economies. Abstract: All forms of economic production and exchange involve the use of energy directly and in the transformation of materials. Until recently, cheap and seemingly limitless fossil energy has allowed most of society to ignore the importance of contributions to the economic process from the biophysical world as well as the potential limits to growth. This paper centers on assessing the energy costs of modern day society and its relation to GDP. Our most important focus is the characteristics of our major energy sources including each fuel’s energy return on investment (EROI). The EROI of our most important fuels is declining and most renewable and non-conventional energy alternatives have substantially lower EROI values than traditional conventional fossil fuels. At the societal level, declining EROI means that an increasing proportion of energy output and economic activity must be diverted to attaining the energy needed to run an economy, leaving less discretionary funds available for “non-essential” purchases which often drive growth. The declining EROI of traditional fossil fuel energy sources and the effect of that on the world economy are likely to result in a myriad of consequences, most of which will not be perceived as good. Energy has played a critical role throughout human society’s demographic, economic and social development. The availability and quality of various energy and material resources to a society is linked to the general trend of the settlement, growth, and eventual decline experienced by each civilization (White, 1959 and Tainter, 1988). A society must have an energy surplus for there to be division of labor, creation of specialists and the growth of cities, and substantially greater surplus for there to be wide-spread wealth, art, culture and other social amenities. Economic fluctuations tend to result, directly or indirectly, from variations in a society’s access to cheap and abundant energy (Tainter, 1988 and Cleveland et al., 1984). Today, fossil fuel resources are among the most important global commodities and are essential for the production and distribution of the rest. Fossil fuels supply greater than 75% of the total energy consumed by societies (EIA data for various years as discussed in Hall et al., 2009). The prosperity and stability of modern society is inextricably linked to the production and consumption of energy, especially oil (Odum, 1973, Hall et al., 1986 and Hall and Klitgaard, 2012; Tverberg, 2012). (1) Decreases in GDP during the post WWII period are chiefly attributable to oil price shocks, not government policy. (2) Oil price shocks are the only novel or surprising price movement observed in a 2-year window of time prior to a recession. (3) Oil price shocks lead to costly reallocations of people and industries as well as fluctuations and pauses in investment. This influences industrial output and subsequently GDP (Jones et al., 2004). The ratio of the monetary cost of energy compared to the GDP generated for the same year gives a quantitative index of how much money is invested in energy on average to generate a unit of wealth. This can be calculated by dividing the money required to buy energy by the total gross domestic product. When this ratio is low, typically around five percent, economies grow strongly (Hall and Klitgaard, 2012). When this ratio is high, about 10% (and, historically, up to 14%), recessions tend to occur. A sudden climb (followed by a subsequent decline) in the proportion of the GDP spent for energy occurred during the two 1970s and the mid-2008 “oil price shocks” (Hall and Cleveland, 1981, Hamilton, 2009 and Hall and Klitgaard, 2012). Rapid increases in the economic cost of energy (e.g. from five to ten percent) result in the diversion of funds from what is typically devoted to discretionary spending to energy acquisition (Hall and Klitgaard, 2012). Consequently, large changes in energy prices influence economies strongly. The energy and economic communities currently host strongly polarized views about whether the quantity of fossil fuel resources ultimately available to society is declining and, if so, the potential repercussions of this for societal well-being and economic growth. Much of the argument used by the energy community revolves around the concepts of “net energy” and “energy return on investment” (EROI). For example, while most energy scientists accept the economists’ argument that there is a lot of oil left in the ground and that higher prices will encourage its extraction and production, they also point out that when more money is required more energy is required too, and that there is a limit to how much we can pay for oil that occurs as one approaches using a barrel of oil to extract another barrel of oil. Such net energy analysis is sometimes called the assessment of energy surplus, energy balance, or, as we prefer, EROI. Energy return on investment (EROI) is a means of measuring the quality of various fuels by calculating the ratio between the energy delivered by a particular fuel to society and the energy invested in the capture and delivery of this energy. Much of the current EROI analysis literature tends to focus on the net or surplus for a given project, industry, nation, fuel, or resource, for example recent discussions on the “energy break even” point of EROI for corn based ethanol, i.e. whether the EROI is greater than 1:1. The apparently different results from this seemingly straightforward analysis generated some controversy about the utility of EROI. But, the variation in these findings is mostly the result of the choice of direct and indirect costs associated with energy production/extraction included within the EROI calculations: i.e. the boundaries of the denominator (Hall et al., 2011). The possible boundaries of the various net energy assessments evaluated in this study are illustrated in Fig. 1. Fig 1. Boundaries of various types of EROI analyses and energy loss associated with the processing of oil as it is transformed from “oil at the well-head” to consumer ready fuels (figure from Lambert and Lambert (in preparation) based on calculations by Hall et al. (2009)). (1) Standard EROI (EROIST): A standard EROI approach divides the energy output for a project, region or country by the sum of the direct (i.e. on site) and indirect (i.e. offsite energy needed to make the products used on site) energy used to generate that output. It does not include e.g. the energy associated with supporting labor, financial services and the like. This EROI calculation is applied to fuel at the point where it leaves the extraction or production facility (well-head, mine mouth, farm gate, etc.). This approach allows for the comparison of different fuels even when the analysts do not agree on the rest of the methodology that should be used ( Murphy et al., 2011). (2) Point of Use EROI (EROIPOU): Point of use EROI is a more comprehensive EROI that includes additionally the costs associated with refining and transporting the fuel. As the boundaries of the analysis are expanded, the energy cost of getting it to that point increases, resulting in a reduced EROI ( Hall et al., 2009). (3) Extended EROI (EROIEXT): This expanded analysis considers the energy required not only to get but also to use a unit of energy. In other words, it is the EROI of the energy at the mine mouth required for that energy to be minimally useful to society, for example to drive a truck ( Hall et al., 2009). (4) Societal EROI (EROISOC): Societal EROI is the overall EROI that might be derived for all of a nation’s or society’s fuels by summing all gains from fuels and all costs of obtaining them. To our knowledge this calculation has yet to be undertaken because it is difficult, if not impossible, to include all the variables necessary to generate an all-encompassing societal EROI value ( Hall et al., 2009). We develop a preliminary method for deriving EROISOC at the national level in another paper in this series ( Lambert et al., 2013). We next present the historical and ongoing trends in EROI findings for various energy sources and discuss the potential impact of low EROI fuels on the continuance of a high EROI society. Our research and that of Dale (2010) summarizes EROI estimates for the thermal energy delivered from various fossil fuels and also the electric power generated using fossil fuel and various other energy technologies. These initial estimates of general values for contemporary EROI provide us with a beginning on which we and others can build as additional and better data become available. We have fairly good confidence in the numbers represented here, in part because various studies tend to give broadly similar results. Values from different regions and different times for the same fuels, however, can give quite different results. Given this, we present these values with considerable humility because there are no government-sponsored programs or much financial support to derive such numbers. EROI values for our most important fuels, liquid and gaseous petroleum, tend to be relatively high. World oil and gas has a mean EROI of about 20:1 (n of 36 from 4 publications) (Fig. 2) (see Lambert et al., 2012 and Dale, 2010 for references). The EROI for the production of oil and gas globally by publicly traded companies has declined from 30:1 in 1995 to about 18:1 in 2006 (Gagnon et al., 2009). The EROI for discovering oil and gas in the US has decreased from more than 1000:1 in 1919 to 5:1 in the 2010s, and for production from about 25:1 in the 1970s to approximately 10:1 in 2007 (Guilford et al., 2011). Alternatives to traditional fossil fuels such as tar sands and oil shale (Lambert et al., 2012) deliver a lower EROI, having a mean EROI of 4:1 (n of 4 from 4 publications) and 7:1 (n of 15 from 15 publication) (Fig. 2). It is difficult to establish EROI values for natural gas alone as data on natural gas are usually aggregated in oil and gas statistics (Gupta and Hall, 2011 and Murphy and Hall, 2010). Fig 2. Mean EROI (and standard error bars) values for thermal fuels based on known published values. Values are derived using known modern and historical published EROI and energy analysis assessments and values published by Dale (2010). See Lambert et al. (2012) for a detailed list of references. Note: please see text for discussion as all these values should not necessarily be taken at face value. The other important fossil fuel, coal, has a relatively high EROI value in some countries (U.S. and presumably Australia) and shows no clear trend over time. Coal internationally has a mean EROI of about 46:1 (n of 72 from 17 publications) (see Lambert et al., 2012 for references) (Fig. 2). Cleveland et al. (2000) examined the EROI values for coal production in the United States. They found a general decline from an approximately 80:1 EROI value during the mid 1950s to 30:1 by the middle of the 1980s. Coal, however, regained its former high EROI value of roughly 80:1 by 1990. This pattern may reflect an increase in less costly surface mining. The energy content of coal has been decreasing even though the total tonnage has continued to increase (Hall and Klitgaard, 2012). This is true for the US where the energy content (quality) of coal has decreased while the quantity of coal mined has continued to increase. The maximum energy from US coal seems to have occurred in 1998 (Hall et al., 2009 and Murphy and Hall, 2010). Meta-analysis of EROI values for nuclear energy suggests a mean EROI of about 14:1 (n of 33 from 15 publications) (see Lambert et al., 2013 for references) (Fig. 3). Newer analyses need to be made as these values may not adequately reflect current technology or ore grades. Whether to correct the output for its relatively high quality is an unresolved issue and a quality correction for electricity appears to contribute to the relatively high value given here. Fig 3. Mean EROI (and standard error) values for known published assessments of power generation systems. Values derived using known modern and historical published EROI and energy analysis assessments and values published by Dale (2010). See Lambert et al. (2012) for detailed list of references. Note: please see text for discussion as all these values should not necessarily be taken at face value. Hydroelectric power generation systems have the highest mean EROI value, 84:1 (n of 17 from 12 publications), of electric power generation systems (see Lambert et al., 2012 for references) (Fig. 3). The EROI of hydropower is extremely variable although the best sites in the developed world were developed long ago (Hall et al., 1986). We calculate the mean EROI value for ethanol from various biomass sources using data from 31 separate publications covering a full range of plant-based ethanol production (e.g. EROI of 0.64:1 Pimentel and Patzek, 2005 for ethanol produced from cellulose from wood to EROI of 48:1 for ethanol from molasses in India (Von Blottnitz and Curran, 2007)). These values result in a mean EROI value of roughly 5:1 with an n of 74 from 31 publications (Fig. 2). It must be noted, however, that many of the EROI figures (33 of the 74 values) are below a 5:1 ratio (see Lambert et al., 2012 for references) and diesel from biomass is also quite low (2:1 with an n of 28 from 16 publications) (see Lambert et al., 2012 for references). The average is skewed in a positive direction by a handful of outliers (four EROI figures are above 30:1) (Von Blottnitz and Curran, 2007 and Yuan et al., 2008 in Dale, 2010). We believe that outside certain conditions in the tropics most ethanol EROI values are at or below the 3:1 minimum extended EROI value required for a fuel to be minimally useful to society. Wind power has a high EROI value, with the mean perhaps as high as 18:1 (as derived in an existing meta-analysis by Kubiszewski et al., 2010) or even 20:1 (n of 26 from 18 publications) (see Lambert et al., 2012 for references) (Fig. 3). The value in practice may be less due to the need for backup facilities. An examination of the EROI literature on solar photovoltaic or PV energy generation shows differences in the assumptions and methodologies employed and the EROI values calculated. The values, assumptions, and parameters included are often ambiguous and differ from study to study, making comparisons between PV and other energy EROI values difficult and fraught with potential pitfalls. Nevertheless, we calculated the mean EROI value using data from 45 separate publications spanning several decades. These values resulted in a mean EROI value of roughly 10:1 (n of 79 from 45 publications) (see Lambert et al., 2012 for references) (Fig. 3). It should be noted that several recent studies that have broader boundaries give EROI values of 2 to 3:1 (Prieto and Hall, 2012, Palmer, 2013 and Weissbach et al., 2013), although these are not weighted for the higher quality of the electricity when compared with thermal energy input. Geothermal electricity production has a mean EROI of approximately 9:1 (n of 30 from 11 publications) (see Lambert et al., 2012 for references) (Fig. 3). A positive aspect of most renewable energies is that the output of these fuels is high quality electricity. A potential draw back is that the output is far less reliable and predictable. EROI values for PV and other renewable alternatives are generally computed without converting the electricity generated into its “primary energy-equivalent” (Kubiszewski et al., 2009) but also without including any of the considerable cost associated with the required energy back-ups or storage. EROI calculations of renewable energy technology appear to reflect some disagreement on the role of technological improvement. Raugei et al. (2012) attribute some low published EROI values for PVs to the use of outdated data and direct energy output data that represents obsolete technology that is not indicative of more recent changes and improvements in PV technology (Raugei et al., 2012). EROI values that do reflect technological improvements are calculated by combining “top-of-the-line” technological specifications from contemporary commercially available modules with the energy output values obtained from experimental field data. Other researchers contend that values derived using this methodology do not represent adequately the “actual” energy cost to society and the myriad energy costs associated with this delivery process. For example Prieto and Hall, 2012 calculated EROI values that incorporate most energy costs, with the assumption that where ever money was spent energy too was spent. They use data from existing installations in Spain, and derived EROI values of roughly 2.4:1, considerably lower than many less comprehensive estimates. Similarly low EROI values for roof top PVs with battery back up were found by Palmer (2013), although it should be noted that the outputs of both systems were higher quality electricity. Nearly all renewable energy systems appear to have relatively low EROI values when compared with conventional fossil fuels. A question remains as to the degree to which total energy costs can be reduced in the future, but as it stands most “renewable” energy systems appear to be still heavily supported by fossil fuels. Nevertheless they are considerably more efficient at turning fossil fuels into electricity than are thermal power plants, although it takes many years to get all the energy back. We summarize existing studies of EROI while attempting to understand the differences among them. Specifically, published values of EROI for similar fuels sometimes are substantially different leading to large differences within the published data for EROI assessments. To reduce these differences Murphy et al. (2011) derived a “standard protocol” for calculating EROI. While recognizing the uncertainties involved in, and inherent to, all EROI calculations, Murphy et al. (2011) proposed that these differences largely can be reduced when similar boundaries are used for the assessment. The generation of EROI values is best developed using industry- or government-derived data on energy outputs and energy costs in physical units, or by using a “process energy method” based on measured energy costs of components. But, more commonly part or all of the data is only in financial units. Energy cost values can be derived from financial costs that can be translated into energy costs using energy intensities (i.e. energy used per monetary unit for that type of activity). Unfortunately, most companies consider their costs proprietary knowledge. Different boundaries and variables differ between nations and may result in conflicting or inconsistent data (Lambert et al., 2013). Only a few countries, including the US, Canada, the UK, Norway, and China keep the necessary industry-specific estimates of energy costs required to perform an EROI analysis. Fortunately, this data, taken as a whole and within a given country, seems to be relatively consistent with information available from various non-governmental sources e.g. Gagnon et al. (2009), or the differences make logical sense. A short description of our methodology for each respective fuel follows. Oil and gas EROI values are typically aggregated together. The reason is that since both often are extracted from the same wells, their production costs (capital and operations) are typically combined, and therefore the energy inputs for EROI calculations are very difficult to separate. Obtaining reliable data on global petroleum production and its associated investment costs can be very difficult since most production is from national oil companies, whose records tend not to be public. Gagnon et al. (2009) estimated global oil and gas EROI from 1992 to 2006 using data from most publicly-traded oil companies summarized by John Herold Company. Cleveland et al., 1984; Hall et al., 1986 and Guilford et al., 2011 used time series data for oil and gas production in the US from several sources (mostly the U.S. Energy Information Agency and Census of Mineral Industries) going back to 1919. Relatively good time series data is available for Norway (Grandell et al., 2011), Mexico (Ramirez, in preparation), Canada (Freise, 2011 and Poisson and Hall, 2013) and China (Hu et al., 2011 and Hu et al., 2013). We evaluate the EROIST for US and Chinese coal, two of the world’s largest producers. For both nations direct energy gains and costs were derived in physical and energy units available from government sources (Balogh et al., 2012 and Hu et al., 2013). In the U.S. analysis, direct energy consumption and indirect costs were derived from physical and financial data published in the U.S. Census of Mineral Industries and the U.S. Economic Census reports (various years, 1919 through 2007). Direct energy consumption was converted from physical units to joules, and the energy equivalent of the indirect monetary costs was derived using the average energy intensity for the entire economy for a given year multiplied by the nominal dollar cost. A sensitivity analysis (for China) was derived using the energy intensity for all “engineering” sectors (see Hu et al., 2013 for details). EROI for various fuels varies from 1:1 to 100:1 with, in general, the highest values being for coal in the US and oil and gas from 1970 to 1990. There is a tendency for EROI for oil and gas production to increase during earlier years of development and then decline over time and with rate of exploitation. We organized existing published and unpublished EROI values by fuel type, year and individual study. This information, presented in Table 1, summarizes our existing knowledge of EROIs for various energy sources by EROI value, geographic region, and time. The EROI for petroleum production appears to be declining over time for every place we have data. Gagnon et al. (2009) were able to generate an approximate “global” EROI for private oil and gas companies using the “upstream” financial database maintained and provided by John H. Herold Company. These results indicate that the EROI for publicly-traded global oil and gas was approximately 23:1 in 1992, 33:1 in 1999 and 18:1 in 2005 (Fig. 4). This “dome shaped” pattern seems to occur wherever there is a long enough data set, perhaps as a result of initial technical improvements being trumped in time by depletion. Fig. 4. Gagnon et al. (2009) estimated the EROI for global publicly traded oil and gas. Their analysis found that EROI had declined by nearly 50% in the last decade and a half. New technology and production methods (deep water and horizontal drilling) are maintaining production but appear insufficient to counter the decline in EROI of conventional oil and gas. Three independent estimates of EROI time series for oil and gas production for the United States are given in Fig. 5 along with some important oil-related historical events (Cleveland et al., 1984, Hall et al., 1986 and Guilford et al., 2011). Fig 5. Time series analyses of oil and gas production within the US including several relevant “oil related” historical events. Each analysis demonstrates a pattern of general increase then decline in EROI with an additional impact of increased exploration/drilling. The data show a general pattern of increase and then decline in EROI over time except as impacted by changes in exploration (drilling) intensity (in, for example, the late 1970s and early 1980s). During the mid 1970s–1980s and late 2000s, the price of oil increased as did exploration intensity, as measured by increased feet drilled and energy used. EROI values tend to decline when there is an increase in the energy required for exploration and drilling. But, usually increased drilling was linked to little or no additional oil discoveries; hence EROI values declined (Fig. 6). The greatly increased amount of money being spent for oil and gas development in the US in recent years suggests that despite the recent increases in production the EROI may continue to decline. Fig 6. US oil and gas values published by Guilford et al. (2011) from 1992 to 2007. Two independent EROI estimates for Canadian production of oil and gas (blue line, from Freise, 2011) (Fig. 7) and oil, gas and tar sands combined (red line, from Poisson, in press) demonstrate that the EROI of conventional oil and gas in Canada has declined considerably in recent decades. Freise (2011) estimates the EROI of western Canadian conventional oil and gas over time from 1947 to 2010. Freise agrees with Poisson that the later values are probably more accurate. Poisson and Hall (in press) found that the EROI of conventional oil and gas has decreased since the mid-1990s from roughly 20:1 to 12:1, a 40% decline. The EROI of conventional combined oil–gas–tar sands has also decreased during this same period from 14:1 to 7.5:1, a decline of 46% (Fig. 8) (Poisson and Hall (in press)). Poisson and Hall’s estimated EROI values for Canadian oil and gas are about half those calculated by Freise and their rate of decline is somewhat less rapid (Freise, 2011 and Poisson and Hall, 2013) (Fig. 8). Fig 8. Canada oil and gas and oil, gas and tar sand values by Freise (2011) and Poisson and Hall (in press). Poisson and Hall’s estimate of the EROI of tar sands is relatively low, around 4.5 (a conservative (i.e. high) estimate, using only the front end of the life-cycle); incorporating tar sands into total oil and gas estimates decreases the EROI of the oil and gas extraction industry as a whole (Poisson and Hall, in press). These estimates would be lower if more elements of the full life-cycle (e.g. environmental impact) were included in the calculation. Norwegian conventional oil and gas fields are relatively new and remain profitable both financially and with regard to energy production. Grandell et al. (2011) estimate that the EROI of oil and gas ranged from 44:1 (during the early 1990s) to 59:1 (1996), to approximately 40:1 (during the latter half of the last decade) (Fig. 9) (Grandell et al., 2011). Fig 9. Time series data on EROI for oil and gas for Norway, Mexico and the Daqing oil field in China based on several papers published in the 2011 special issue of the journal Sustainability and works in progress. Ramirez’s trends for the EROI of Mexican oil and gas suggest that this country may have peaked twice in the past decade. 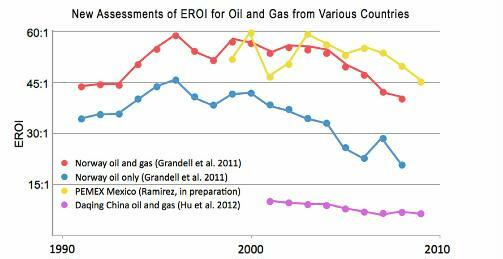 The EROI for conventional oil and gas production in Mexico declined from roughly 60:1 in 2000 to 47:1 the following year, but returned to 59:1 by about 2003 (Fig. 9) (Ramirez, in preparation). This was followed by a steady decline over the following six years reaching 45:1 by 2009. The collapse of production from the Cantarell field in the Gulf of Mexico, once the world’s second largest, appears largely responsible for this decline. The EROI for the Daqing field, China’s largest conventional oil field, has declined continuously from 10:1 in 2001 to 6:1 in 2009 (Fig. 9) (Hu et al., 2011). The data represented in Fig. 10 includes analyses for a portion of the US and for all of Canada. Since most published numbers combine data on natural gas with that of oil, it is usually difficult or impossible to assess the production costs of these fossil fuel resources independently. Sell et al.’s (2011) trends for EROI of natural gas in Pennsylvania (US) has an undulating decline; from roughly 120:1 in 1986 to 67:1 in 2003. This value is probably a high value as some important indirect costs were not included. Freise (2011) estimated the EROI of western Canadian natural gas from 1993 to 2009 and found that the EROI of natural gas has been decreasing since 1993 through 2006, from roughly 38:1 to 14:1. This trend shifted in 2006 as exploitation intensity declined resulting in a steady increase and an EROI of roughly 20:1 by 2009 (Fig. 10) (Freise, 2011). Aucott and Melillo (2013) found values similar to Sell et al. for “fracked” shale gas from Pennsylvania from, presumably, “sweet spots”. Fig 10. Two published studies on the EROI of dry (not associated with oil) natural gas: Sell et al. (2011) examined tight natural gas deposits in western Pennsylvania in the US, and Freise (2011) analyzed all convention natural gas wells in western Canada. The only EROI analyses for coal production are from the US and China because information on the energy expended to extract coal in other areas of the world appears unavailable. Time series of EROI for coal production for the United States and China are given in Fig. 11. A great deal of variability in EROI is evident in these figures. This data, however, have significant holes (e.g. no data is reported for approximately 30 years, from the mid 1950s to the mid 1980s). Cleveland’s work provides additional information for three noncontiguous years that is only partly consistent with Balogh et al.’s findings. Hu et al. (2013) establishes annual data for Chinese coal production for the years 1994 through 2009. These show very little variation in EROI values. Fig 11. EROI for US and Chinese coal production derived from Cleveland (1992), Balogh et al. (unpublished data) and Hu et al. (2013). There are four major challenges for calculating the EROI of various fuels at the national, regional and global scale. First is the lack of data on fuel used during the extraction process. Data on on-site non-traded fuels generally is not readily available, although ideally they are reported to government agencies undertaking census work. Often indirect energy cost calculations must be derived from financial data. This requires converting currency into an energy equivalent (e.g. mega joules used per dollar of GDP). Methods for accomplishing this conversion usually assume that expenditure for inputs to the energy industry are the same as for society more generally or for an engineering component. They may be less accurate but sensitivity analyses can be undertaken to address uncertainties. Ideally Input–output analysis is undertaken which can give much more accurate results. This analysis used to be done by a team at the University of Illinois but these results are seriously outdated. A more recent analysis may have been done at Carnegie-Mellon’s Green Building Program, from which useful general values can be obtained (See Prieto and Hall, 2012, chapter 4). Second is the issue of variation in scale. Are studies at the regional level comparable to those at the national level and how do these “size up” when presented next to “international” studies that include a small subset of representative countries? Various variables and boundaries often vary with the scale of investigation making it difficult to compare data among diverse analyses. Third, energy analysts are not in agreement on what indirect costs should and should not be included in an EROI assessment. When complete systems are analyzed for solar PV installations, their financing, their operations and maintenance costs and their backups are included the energy costs are about three times larger than for just the modules and inverters. One very contentious indirect cost is the inclusion or exclusion of the energy cost of supporting human labor (Murphy et al., 2011). This can result in varying and potentially controversial assessments especially when assessing fuels where small differences may determine whether that fuel is perceived as a viable energy option (e.g. corn-based ethanol). Fourth, is that the quality or utility of these various fuels is represented differentially within different data sets. Total primary energy consumption values at the global level published by the U.S. Energy Information Agency, International Energy Agency (IEA), and BP (Hayward, 2010); Smil, 2008, tend to be similar. They occasionally vary, however, in their method of addressing “primary energy” conversion. For example, EIA data includes the heat generated by nuclear power in its energy output assessments. Various researchers, government agencies and industry organizations present data from a variety of sources using various assessments, e.g. national (EIA), global (IEA) and industrial (BP). Laherrère addressed this issue at the 2011 ASPO conference (Laherrère, 2011). He also noted that IEA data is presented as the direct electricity generated for nuclear and hydropower, while EIA data includes waste heat produced by nuclear fission. There is a broadly consistent pattern to our results, as indicated by the similar temporal patterns of different studies, all of which (except coal) have declined over time (and with increased effort) and by the fact that regions developed for oil and gas for a longer period (e.g. US, China or anywhere over time) have lower EROIs, while newer developments (e.g. Norway) tend to have higher values. If and as the Murphy et al. (2011) protocol is more universally followed we expect even greater consistency in results. Our research summarizes EROI estimates for all industrial fuels, and for the three major fossil fuels, coal, oil and natural gas over time. These initial estimates of general trends in EROI provide us with a beginning on which we and others can build as additional and better data become available. The industrial revolution was in full swing by the early 1900s (Fig. 2). Abundant high quality coal from relatively thick seams (with high EROI), capable of generating an enormous amount of energy, was harnessed by humans to do all kinds of economic work including: heating, manufacturing, the generation of electricity and transportation. Biomass energy, in the form of wood burning for domestic use (heating and cooking), remained an important contributor to the world’s energy portfolio (Perlin, 1989). During this period the oil industry was in its infancy and was primarily used for transportation and lighting (in the form of kerosene in non-urban/non-industrial regions). High quality oil remained a small contributor to the energy mix until the end of the 1930s although it was increasing rapidly on a global scale (Hall and Klitgaard, 2012). The massive WWII war effort during the 1940s saw increased use of coal and oil for the manufacture and use of war machinery. During the post-war era, the great oil discoveries of the early twentieth century found a use in global reconstruction and industrialization. Throughout the 1950s and 1960s the repair of war-torn Europe and the proliferation of western culture resulted in massive increases in the manufacturing and transport of goods and the oil necessary for their production and use. By the late 1960s the EROI of coal (mostly from deep mines) began to decline while the EROI of oil remained high. The EROI for coal production in the US declined from 80:1 in the 1950s to 30:1 in the 1970s (Cleveland et al., 1984). During this time period, coal was mined almost exclusively in the Appalachian mountain region areas of the US using a combination of room and pillar mines with conventional and continuous mining methods. The coal initially extracted from these locations was a combination of anthracite and high quality bituminous coal, coal with high BTUs/ton. As the best coal was used first, the EROI for coal decreased over time. The quality of coal being produced was decreasing while world oil production was increasing. The peak of US oil production in 1970 and subsequent peak of US conventional natural gas in 1973 meant an increased reliance on OPEC oil. Increases in oil prices reflected in part increased energy required to purchase this fuel. The price of other economic activities increased at similar rates (Hall and Klitgaard, 2012). After the oil shocks of the 1970s, oil prices surged in the US and around the world, stimulating both increased drilling activity and greater interest in the exploitation of more marginal resources (those with higher production costs) (Guilford et al., 2011). Increased drilling activity in the U.S. did not result in increased production but caused a sharp decline in the EROI for conventional oil and gas for the US between the early 1970s and mid 1980s. The oil shocks of the 1970s temporarily halted a long period of increased oil use. It also generated a global oil market and price, destroying an advantage once held by the US. Recovery of production did not occur in the continental US where oil production had declined since its peak in 1970; until the rather recent uptick in 2008 following the introduction of the “new” technologies of horizontal drilling and hydraulic fracturing. New work on the EROI for oil and gas produced by horizontal drilling and rock fracturing indicate that the EROI can be very high, in part because it is not necessary to pressurize the fields (e.g. Aucott and Mellilo 2013; Moeller and Murphy personal communication; Waggoner personal communication) but that these high values are likely to decline substantially as production is moved off the “sweet spots”. In the 1980s post “energy price shock” era, oil that had been found but not developed suddenly became worthy of developing. Many world oil resources, incentivized by higher prices, were developed; some were over developed. Important gains in oil and gas production occurred in some non-OPEC countries including Norway, Mexico, and China. Heating and transportation, historically fueled by coal, was transformed to oil and gas. Energy from coal production shifted to, and remained essential to, manufacturing and increasingly the production of electricity. The EROI of US coal returned to 80:1 by about 1990. This pattern reflects a shift in the quality of coal extracted, the technology employed in the extraction process and especially the shift from underground to surface mining. A shift in mining location, from Appalachia to the central and northern interior states of Montana and Wyoming and extraction method, from underground to surface mining (area, contour, auger, and mountain top mining techniques) have resulted in less energy required to mine and beneficiate coal. The energy content of the coal extracted, however, has decreased. The coal currently mined is lower-quality bituminous and sub-bituminous coal with much lower BTUs/ton (Hall et al., 1986 and Hall and Klitgaard, 2012) The increased efficiency of surface mining seems to just about compensate for the decline in the quality of the coal mined. See Section 7 for a consideration of environmental externalities. Between 1985 and the early 1990s international oil and gas prices fell, then remained stable until 2000 while drilling effort declined until the mid 2000s. Thus the 1990s was a period of abundant oil and plummeting oil prices bringing the real cost of oil back to that of the early 1970s (Hall and Klitgaard, 2012). Discretionary spending in the US and other western nations, often on housing, increased. The late 1990s was a time of reduced oil exploration efforts apparently resulting in an increase in EROI. The mid 2000s marked an increase in global oil and gas exploration efforts (Smil, 2008). Discretionary spending decreased with the energy price increases from 2007 to the summer of 2008. Oil prices hit an all time high of $147 per barrel in the summer of 2008 (Read, 2008). This extra 5–10% “tax” from increased energy prices was added to the US (and other) economy as it had been in the 1970s, and much discretionary spending disappeared (Hall et al., 2008). Speculation in real estate (in the US) was no longer desirable or possible as consumers tightened their belts because of higher energy costs (Hall and Klitgaard, 2012). The stock market crashed in September 2008 reducing market value by $1.2 trillion and forcing the Dow to suffer its “biggest single-day point loss ever” (Twin, 2008), and most Western economies have essentially stopped growing since. In general there has been a decade-by-decade decline in growth of the US economy since 1935, in step with the decline in the annual rate of change for all oil production liquids globally (Hall et al., 2012). 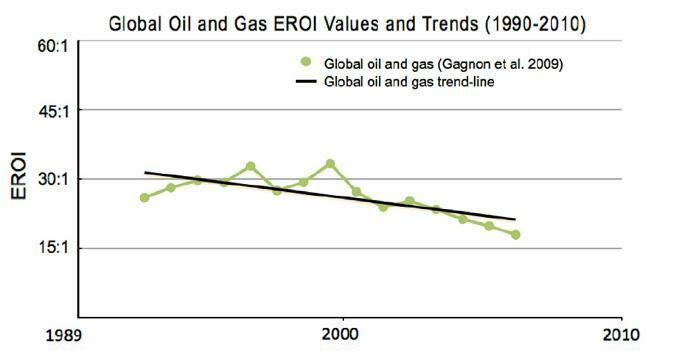 Even though the global EROI for producing oil and gas continues to be reasonably high, it is probable that the EROI of oil and gas will continue to decline over the coming decades (Gagnon et al., 2009). The continued pattern of declining EROI diminishes the importance of arguments and reports that the world has substantially more oil remaining to be explored, drilled and pumped. “High” EROI values for oil and gas production are increasingly attributable to the inclusion of high EROI natural gas (e.g. the EROI of Norwegian oil is about half that for oil and gas combined) (Grandell et al., 2011). The recent declining trend is described by Grandell et al. as probably due to “aging of the fields.” It is likely that varying drilling intensity has had minimal impact on the net energy gain of these fields. Grandell et al. (2011) expects the EROI of Norwegian oil and gas production “to deteriorate further as the fields become older”. Meanwhile, China’s use of oil has expanded enormously so that China has been importing a larger and larger proportion of its oil from the rest of the world. Recently, China has increased its oil exploitation efforts tremendously, both inside and outside of China. Even so, Hu et al. (2011) suggest that China appears to be approaching its own peak in oil production. Since 2008 producers have shifted increasingly to non-conventional oil and gas resources (tar sands, shale oil and gas) which have increased production but also costs. New technologies such as horizontal drilling and hydro-fracturing are currently keeping the total levels of non-conventional and conventional natural gas production in the US at rates similar to those of 1973 from conventional natural gas alone. Given the numerous shifting environmental variables and social issues surrounding horizontal drilling and “fracking”, it is difficult to predict the future of non-conventional oil and gas (Hall and Klitgaard, 2012). Already some areas of production from the Barnett and Haynesville formations appear to have reached a production plateau (Hughes, 2013). Recent analyses by Hughes (2013) argue against assuming production will continue to increase. Much of the discussion about “peak coal” (e.g. Patzek and Croft, 2010) involves changing mining technology and capacity, rather than the quantity and quality of coal that remains available for extraction. Peak coal will likely have the greatest impact on the world’s largest coal user, China. Nations with abundant untapped coal resources (i.e. the US, Australia and Russia) are likely to be less affected. The total recoverable coal estimated for the US alone is approximately 500 billion tons. US coal production in 2009 was about one billion tons. Although it is difficult to predict future production technology, environmental issues, consumption patterns and changes in EROI, it appears that coal may be abundantly available through the next century. • currently, lack the infrastructure that is required to meet current societal demands. If we were to replace traditional nonrenewable energy with renewables, which seems desirable to us in the long run, it would require the use of energy-intensive technology for their construction and maintenance. Thus it would appear that a shift from non-renewable to renewable energy sources would result in declines in both the quantity and EROI values of the principle energies used for economic activity. Although wind, apparently relatively favorable from an EROI perspective and photovoltaic (PV) energy, are currently the world’s fastest growing renewable energy sources, they continue to account for less than one percent of the global energy portfolio (REN21, 2012). Nevertheless there are many informal reports of PV reaching “price parity” with fossil fuels and to many the future of PV is very bright. Proponents of EROI assessments using actual operational installations (rather than laboratory estimates) believe that, in order to portray renewable energy technology accurately, it is necessary to make note of the fact that these technologies are dependent upon (i.e. constructed and maintained using and therefore subsidized by) high EROI fossil fuels. Higher EROI values found in conceptual studies often result from assumptions of more favorable conditions (within simulations) than those actually experienced in real life. For example, English wind turbines were found to operate considerably fewer hours per month than anticipated (Jefferson, 2012). Kubiszewski et al. (2010) infer that variations in EROI values, in the case of reported EROI values for wind energy, (between process and input output analyses) stems from a greater degree of subjective system boundary decision-making by the process analyst, resulting in the exclusion of certain indirect costs. Other researchers believe that the focus of EROI assessments must be on net energy produced from existing installations and variables associated with wind and PV modules once they have entered the infrastructure rather than extrapolating into the future. Examination of concrete input and output data from operational facilities, e.g. wind turbines (Kubiszewski et al., 2010), appears to offer the best opportunity to calculate wind and PV EROI values accurately. Also of concern is that wind and PV technology are not “base load technologies”, meaning that future large scale deployment, beyond 20 percent of the grid capacity, will likely require the construction of large, energy intensive storage infrastructures which, if included within EROI assessments, would likely reduce EROI values considerably. In the case of wind, the cost for inclusion within a wind EROI analysis requires not only the initial capital costs per unit output but also the backup systems required for the 70 or so percent of the time when insufficient wind is blowing. Thus, the input for an EROI analysis of wind and PV technology is by and large “upfront” capital costs. This is in sharp contrast to the less well known “return” over the lifespan of the system. Therefore, a variable referred to as “energy payback time” is often employed when calculating the EROI values of wind and other renewable energy sources. This is the time required for the renewable energy system to generate the same amount of energy that went into the creation, maintenance, and disposal of the system. The boundaries utilized to define the energy payback time are incorporated into most renewable EROI calculations. Other factors influencing wind and PV EROI values include energy storage, grid connection dynamics and variations in construction and maintenance costs associated with the installation location. For example, off-shore turbines, while located in wet salty areas with more reliable energy-generating winds, require replacement more often. Turbines located in remote mountainous areas require long distance grid connections that result in energy loss and reduced usable energy values (Kubiszewski et al., 2010). In conclusion, the EROI for the world’s most important fuels, oil and gas, has declined over the past one to two decades for all nations examined. It remains possible that the relatively high EROI values for the natural gas extracted during, and often used for, the production of oil may mask a much steeper decline in the EROI of oil alone. Declining EROI is probably already having a large impact on the world economy (Murphy and Hall, 2010 and Tverberg, 2012). As oil and gas provide roughly 60–65% of the world’s energy, this will likely have enormous economic consequences for many national economies. Coal, although abundant, is very unevenly distributed, has large environmental impacts and has an EROI that depends greatly on the region mined. A general decline in the energy content of US coal resource over time may be compensated by a shift from energy-intensive underground mining of relatively high quality (but declining) Eastern US coal resources to lower-cost surface mining of lower energy-content Western US coal resulting in no clear trend in EROI for coal. The decline in EROI among major fossil fuels suggests that in the race between technological advances and depletion, depletion is winning. Past attempts to rectify falling oil production i.e. the rapid increase of drilling after the 1970 peak in oil production and subsequent oil crises in the US only exacerbated the problem by lowering the net energy delivered from US oil production (Hall and Cleveland, 1981). Increasing prices, thought by most economists to negate depletion through increasing incentives for exploitation, cannot work as EROI approaches 1:1, and even now has made oil too expensive to support the high economic growth it once did. It would be tempting, from a net energy perspective, to recommend that we replace fossil fuels with renewable energy technologies as the EROI for fossil fuel falls to a level where these technologies become competitive. While EROI analyses generate numerical assessments using quantitative data that include many production factors, they do not include other important data such as climate change, air quality, health benefits, and other environmental qualities that are considered “externalities” to these analyses. The energy intensive carbon capture and sequestration (CCS) required to reduce fossil fuel emissions to levels equivalent with that of wind or PV electricity production would reduce the final coal EROI value considerably ((e.g. Akai et al. 1997 in Dale, 2010 and Lund and Biswas, 2008). EROI figures do not take into account the high life-cycle greenhouse gas emissions from thermal electricity production, and coal-fired systems in particular (Raugei et al., 2012). This could, with difficulty, be worked into future, more comprehensive EROI calculations. Most alternative renewable energy sources appear, at this time, to have considerably lower EROI values than any of the non-renewable fossil fuels. Wind and photovoltaic energy are touted as having substantial environmental benefits. These benefits, however, may have lower returns and larger initial carbon footprints than originally suggested (e.g. the externalities associated with the mining of neodymium and its subsequent use in wind turbine construction). The energy costs pertaining to intermittency and factors such as the oil, natural gas and coal employed in the creation, transport and implementation of wind turbines and PV panels may not be adequately represented in some cost-benefit analyses. On the positive side, the fact that wind and PV produce high quality electricity needs to be considered as well. Thus society seems to be caught in a dilemma unlike anything experienced in the last few centuries. During that time most problems (such as needs for more agricultural output, worker pay, transport, pensions, schools and social services) were solved by throwing more technology investments and energy at the problem. In many senses this approach worked, for many of these problems were resolved or at least ameliorated, although at each step populations grew so that more potential issues had to be served. In a general sense all of this was possible only because there was an abundance of cheap (i.e. high EROI) high quality energy, mostly oil, gas or electricity. We believe that the future is likely to be very different, for while there remains considerable energy in the ground it is unlikely to be exploitable cheaply, or eventually at all, because of its decreasing EROI. Alternatives such as photovoltaics and wind turbines are unlikely to be nearly as cheap energetically or economically as past oil and gas when backup costs are considered. In addition there are increasing costs everywhere pertaining to potential climate changes and other pollutants. Any transition to solar energies would require massive investments of fossil fuels. Despite many claims to the contrary—from oil and gas advocates on the one hand and solar advocates on the other—we see no easy solution to these issues when EROI is considered. Unfortunately recent political events do not leave us with great optimism that such changes in societal values will be forthcoming. Aucott, M. L. and Jacqueline M. Melillo, 2013. A Preliminary Energy Return on Investment Analysis of Natural Gas fromthe Marcellus Shale. Journal of Industrial Ecology 17, 668-679. Balogh, S.; Guilford, M.; Arnold, S.; Hall, C., unpublished data 2012. EROI of US coal. Energy price increases and the 2008 financial crash: a practice run for what’s to come? Hall, C., Balogh, S., Lambert, J., 2012. Peak oil, Declining EROI and the New Economic Realities. ASPO-USA Webinar, Presented on 2 August 2012. Available from: 〈www.ASPOUSA.org/wp-content/uploads/2012/08/PeakOil_EROI_EnergyEconReality.pdf〉 (accessed: 25.03.13). Hughes, J.D., 2013. Drill, Baby, Drill: Can Unconventional Fuels Usher in a New Era of Energy Abundance? The Post Carbon Institute, USA. Available from: 〈http://www.postcarbon.org/reports/DBD-report-FINAL.pdf〉. Hamilton, J., 2009. Causes and Consequences of the Oil Shock of 2007–2008. Brooking Papers on Economic Activity, Spring, 215–283. Kubiszewski, I., Cleveland, C., Szostak, R., 2009. Energy return on investment (EROI) for photovoltaic energy. The Encyclopedia of Earth: Boston, USA. Available from: 〈http://www.eoearth.org/article/Energy_return_on_investment_(EROI)_for_photovoltaic_energy〉 (accessed on 1.06.11). Laherrère, J., November 2011. Saving Energy: Reality of National Energy Flows. ASPO USA 2011 Peak Oil and Energy Conference: Washington D.C., USA. Available from: 〈www.ASPOFrance.viabloga.com/files/JL_ASPOUSA2011.pdf〉 (accessed on 24.03.13). Lambert, J., Lambert, G., 2013. Life, Liberty, and the Pursuit of Energy: Understanding the Psychology of Depleting Oil Resources. Karnak Books: London, UK, (in preparation). Lambert, J., Hall, C., Balogh, S., Poisson, A., Gupta, A., 2012. EROI of Global Energy Resources: Preliminary Status and Trends. Report 1 of 2. UK-DFID 59717, 2 November 2012. Poisson, A., Hall, C., 2013. EROI of Canadian Oil and Gas, and Tar Sands, Energies, (in press). Ramirez, P., 2013. The Relation of Oil to the Mexican Economy: Past, Present and Future, (in preparation). Read, M., 2008. Oil sets new trading record above $147 a barrel. USA Today, 11 July 2008. Available from: 〈http://usatoday30.usatoday.com/money/economy/2008-07-11-3815204975_x.htm〉 (accessed on 20.03.13). REN21, 2012. Renewables: Global Status Report; Renewable Energy Policy Network for the 21st Century: Paris, France. Available from: 〈www.map.ren21.net/GSR/GSR2012.pdf〉 (accessed on 20.03.12). Twin, A., 2008. Stocks Crushed: Approximately $1.2 Trillion in Market Value is Gone After the House Rejects the $700 Billion Bank Bailout Plan. CNN Money, 29 September 2008. Available from: 〈http://money.cnn.com/2008/09/29/markets/markets_newyork/〉 (accessed on 20.03.13).